iCar Asia Sdn Bhd (“iCar Asia”) strives to properly address applicable data protection and privacy legal requirements relating to the Personal Data (as defined below) that it collects and processes of visitors to its network of websites which are listed on –www.iCarAsia.com and the iCar Asia vehicle search engine wherever distributed on the internet (collectively, the ‘iCar Asia Network’). This Personal Data Protection Notice (“Notice”) describes how iCar Asia uses your Personal Data. This Notice forms part of the Terms and Conditions of Use of One2Car.com (collectively, “the Sites” and individually “the Site”). By using and visiting the iCar Asia Network and/or the respective Sites, you agree to the processing, use and disclosure of your Personal Data by iCar Asia and all persons involved in the provision of services by iCar Asia including third party research firms, contractors, agents and service providers of iCar Asia. In the event of any conflict between the English and other language versions of this Notice, the English version shall prevail. iCar Asia shall have the right to modify, update or amend the terms of this Notice at any time by placing the updated Notice on the Sites. By continuing to communicate with iCar Asia or by continuing to use iCar Asia’s services following the modifications, updates or amendments to this Notice shall signify your acceptance of such modifications, updates or amendments. iCar Asia publishes or makes available on the iCar Asia Network information, advertisements, product and service offers, vehicle data, valuations, Software and links and other content supplied by iCar Asia and third parties (‘Material’). iCar Asia does not warrant, represent, authorise or endorse the reliability, accuracy or completeness of any such Material published on the iCar Asia Network or on any web site that links from the iCar Asia Network (including third party display advertisements). iCar Asia does not and cannot provide any warranty in relation to any goods or services advertised for sale on the iCar Asia Network by third parties including, but not limited to, any representation or warranty that the goods or services are of merchantable quality, fit for the purpose intended, safe for the purpose intended, as described by the seller or owned by the seller. This Notice describes how iCar Asia uses your Personal Data when you are on the Sites and when you use its services. This Notice does not describe information collection policies on other sites, including those linked to or from the Sites. iCar Asia collects Personal Data that it considers necessary for it or its related companies/corporations to provide the range of services offered by iCar Asia. The provision of your Personal Data is voluntary. However, if you do not provide your Personal Data, iCar Asia may not be able to (i) communicate with you; (ii) provide you the services you require or (iii) you may not be able to access certain sections of the Site. “Personal Data” means information about you which you have provided to iCar Asia, such as your name, address, telephone number, NRIC No., email address, your personal preferences, bank account information, IP addresses, photographs and images, call recordings of you and any other information which may identify you that has been or may be collected, stored, used and processed by iCar Asia from time to time which includes but is not limited to the information further described below. Information collected by iCar Asia as visitors use the Sites. You need to sign up to use certain products, services, and tools on the Sites which require you to provide information about yourself, such as your name, NRIC No./ passport No., physical address, email address, and telephone number(s). For example, you may provide such information if you sign up for a new account, newsletters, complete our "Feedback" form, or use a social media tool. When you list a car for sale, iCar Asia will request for information about the car and on how you can be contacted by potential buyers (including information like your telephone number(s) and email address). iCar Asia may use your Personal Data in order to communicate with you and provide you with the products, services, or tools you have requested. To make use of certain features on the respective Sites, visitors need to provide limited information about themselves and their interests so that iCar Asia can tailor the information iCar Asia provides to their needs. For example, to help you find the car you want close to home, iCar Asia will need to know what kind of car you are looking for and your location. iCar Asia will ask you to provide this information when you perform a search and this information is utilised by iCar Asia to help you find the car you are looking for or as otherwise described in this Notice. From time to time, iCar Asia may offer sweepstakes or other promotions on the respective Sites. If you enter a sweepstakes or promotional contest, you will be required to provide information about yourself (such as your name, NRIC No./ passport no., telephone number, address, date of birth, and email address). Among other things, iCar Asia will use this information to contact you if you win, and iCar Asia may also use this information for marketing purposes and such information may therefore be published or made public. iCar Asia may share this information with any co-sponsor/ co-organiser of the contest or sweepstakes; iCar Asia will identify the co-sponsor/ co-organiser in the contest rules. iCar Asia may also share this information with shipping or fulfilment companies or other third-party service providers that help administer our promotions, such as by conducting drawings, and/or delivering prizes to winners. If you do not want iCar Asia or such other third parties to collect the information requested in the contest or sweepstakes registration form or to provide it to co-sponsors/ co-organisers, please do not enter the contest or sweepstakes. From time to time, iCar Asia may conduct a survey on its users to measure their satisfaction with the Network and to help iCar Asia learn more about its audience and how they interact with the iCar Asia Network. Third-party research firms often conduct these surveys on our behalf. iCar Asia uses the survey results to help it improve the services that it offers to you. iCar Asia will take the information you provide and aggregate it on an anonymous basis with data collected from other survey participants. iCar Asia may use and disclose that pool of anonymous information as it sees fit, without identifying you personally. You may also find on the Sites, invitations to participate in surveys conducted by advertisers of iCar Asia, whose personal data protection policies are not controlled by iCar Asia. These invitations will usually link to an online survey form that is hosted either by the advertiser conducting the survey or by a third-party research firm working on the advertiser's behalf. When you access an advertiser's survey through the Sites, the use and disclosure of any information you submit will be governed by the advertiser's personal data protection policy (or by the personal data protection policy of the advertiser's research firm), which may differ from iCar Asia’s. If you cannot find the applicable personal data protection policy via a link either from the advertiser's survey invitation or from the online survey form, you should contact the advertiser directly for more information. iCar Asia may use your email address and/or telephone number(s) to respond to requests you make for iCar Asia’s products or services or to respond to your communications with iCar Asia. iCar Asia may also contact you to inquire about your experience on the Sites, to provide you with information about the products and services available from iCar Asia and/or its affiliates, or to communicate to you information related to the automotive industry. From time to time, iCar Asia may contact you via telephone and/or send you emails, MMS, SMS and/or WhatsApp messages that include special promotions and other commercial offers that iCar Asia thinks may be of interest to you. We hope you will find these communications informative and useful. If you do not, you can unsubscribe at any time from any of our commercial marketing/ communication programs by following the simple instructions included in an email you receive in connection with the respective programs. If you request for a car using our Latest Car Requests, iCar Asia will use and share your email address and other relevant Personal Data with participating dealers. To access your account, iCar Asia will ask you to register with iCar Asia on the form provided, which may include personally identifiable information such as your email address. You may also be asked to provide additional optional personal information, such as your name, gender, race and age. You agree to provide true, accurate, current, and complete information about yourself. We use this information to process your registration request, provide you with the services and communications that you request, customize features that appear on the Sites, measure traffic on the Sites, and improve the Sites and the services and features offered to users. We may share information we collect while you are using the Sites, including registration information, with our affiliates and with trusted third-party service providers who assist iCar Asia in providing services. If you choose to post information/ content to any of the interactive areas of the Sites, such as discussion forums, comments fields, and social media areas, please keep in mind that the information/ content you post can be seen, collected, and used by anyone who has access to those areas. You may also have the opportunity from time to time to respond to questions that iCar Asia displays to users of the Sites. If you choose to respond, your response may be published on an area of the respective Site accessible to other users or the public. We are not responsible for any third-party use of such information/ content. to the purchaser (or prospective purchaser) of any business or asset which iCar Asia is (or is contemplating) selling. If you do not consent to iCar Asia processing your Personal Data for the purposes listed above, please notify iCar Asia using the contact details stated below. To help iCar Asia (and in some cases the advertisers and third-party providers of iCar Asia) keep track of how many users are accessing particular pages or listings within the Sites, and to track how users respond to ads placed by iCar Asia on third-party websites, iCar Asia may place a small file, called a web beacon, on some of the pages and on some of the listings and ads iCar Asia distributes. iCar Asia may also place a web beacon in the emails it sends to you. When you open one of iCar Asia’s emails or click on links within these emails, iCar Asia tracks this click-through data to help it determine your interest in particular topics and measure the effectiveness of its communications to you. If you prefer not to be tracked in this way, you should not open these emails or click text or graphic links in the emails. Your IP address. (This is a numerical address that is used by computers connected to the Internet to identify your computer so that data (such as the web pages you want to view) can be transmitted to you. iCar Asia also uses IP address information for systems administration (including fraud detection and prevention) and troubleshooting purposes. iCar Asia may also collect information about the website you were visiting before you came to the Sites and the website you visit after you leave the Sites. Cookies, beacons, information collected about your computer or device, and other data collection technologies ("Data Technologies") may be used individually or in combination in order to provide and/or administer iCar Asia’s services, to help it understand user behaviour, to monitor the Sites’ performance, optimize ads and measure advertising performance. iCar Asia may collect, or have a third party collect on its behalf, data on how visitors use and navigate through the Sites, such as the number of users who visit various pages within the Sites, what they click on, whether they scroll up or down on particular pages, fill out forms, etc. iCar Asia uses this information to improve the Sites and learn about users, and may disclose it to its affiliates (including, among others, the members of the iCar Asia Network corporate family), or to third parties. The Sites have relationships with certain third-party advertising networks, Advertisers, and advertising services ("Advertising Services") that collect data, target and serve some of the advertisements, promotions, or other marketing messages you see on the Sites and other websites and mobile applications, including websites owned and/or operated by affiliates of iCar Asia. Such Advertising Services may, including through processes that iCar Asia does not control, use Data Technologies from third party companies to collect data from your activities on these websites, on other websites owned and/or operated by affiliates of iCar Asia, or with other websites. 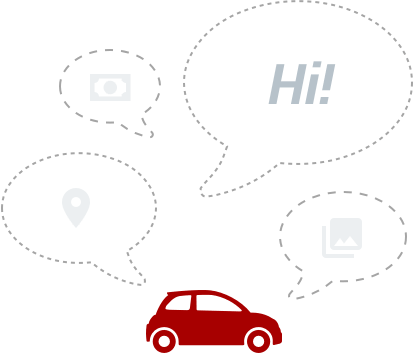 These technologies may be used to track user behaviour, how iCar Asia’s products and services are offered, conduct consumer research and possibly to serve you relevant ads and content. These companies may also obtain information, including personally identifiable information, from services you use from other companies, including without limitation, other websites, mobile websites or applications, and combine the information they obtain through these Data Technologies with information obtained through products and services provided by iCar Asia. Their collection and use of this data is subject to their respective privacy policies/personal data protection policies. If you choose not to provide personal information when requested, the Sites may not be able to provide you with the full range of services. You are given the opportunity to 'opt-out' of having your Personal Information used for purposes not directly related to the Sites at the point where iCar Asia requests for it. If you do not wish to have information on you used in any of the aforesaid manner, please notify iCar Asia using the contact details stated below. If you do not want to receive e-mail or other mail from iCar Asia, you can click on the unsubscribe link in the emails to remove your email address from the iCar Asia mailing list. individuals and organisations that advertise with the respective Sites if you submit an enquiry with iCar Asia. If you do not want iCar Asia to disclose your Personal Data to these individuals and organisations, please do not submit enquires. Kindly be informed that if required for any of the foregoing Purposes, your Personal Data may be transferred and/or disclosed to any party within or outside Thailand including but not limited to companies within the iCar Asia Group including the respective licensees, agents, business partners and/or service providers and under confidentiality and security conditions. This Notice only applies to the collection and use of Personal Data by iCar Asia. It does not cover third party sites to which iCar Asia provides links, even if such sites are co-branded with the iCar Asia logo. When you are on the Site, you could be directed to other sites that are beyond the control of iCar Asia including hyperlinks to advertisers, merchants, sponsors, and content partners. iCar Asia does not share your Personal Data with third party websites. iCar Asia is not responsible for the privacy and conduct practices of these third party websites, so you should read their own privacy policies before disclosure of any Personal Data to these websites. You acknowledge that when you click on a hyperlink that leaves the Sites, the website which you are directed to is not within the control of iCar Asia, and you acknowledge that the Sites shall not be responsible for those websites or any damages or losses incurred by you resulting thereto. iCar will not sell your personal information to any third party without your permission, but it cannot be responsible or held liable for the actions of third party websites which you may have linked or been directed to from the Sites. iCar Asia’s databases are stored on servers and storage devices located in Malaysia, Singapore, and various other parts of the world. These locations may not guarantee the same level of protection for Personal Data as the locality or country in which you reside. By using the Sites, you expressly agree to the processing, collection, use, disclosure, and transfer of your information (including Personal Data) by iCar Asia for the purposes identified herein, and you consent to the transfer of such information outside of your country. By your use of the iCar Asia Network, you understand and consent to the transfer of your Personal Data out of Thailand as described herein. iCar Asia uses commercially reasonable physical, managerial, and technical safeguards to preserve the integrity and security of your Personal Data and will not knowingly allow access to this data to anyone outside iCar Asia, other than to you or as described in this Notice. However, iCar Asia cannot ensure or warrant the security of any information you transmit to iCar Asia and you do so entirely at your own risk. In particular, iCar Asia does not warrant that such information may not be accessed, altered, collected, copied, destroyed, disposed of, disclosed or modified by breach of any of iCar Asia’s physical, technical, or managerial safeguards. This Notice is governed by and shall be construed in accordance with the laws of Thailand. You hereby submit to the non-exclusive jurisdiction of the Thailand courts. Name: iCar Asia (Thailand) Co., Ltd. In respect of your right to access and/or correct your Personal Data, iCar Asia has the right to impose an administrative fee, refuse the your requests to access and/or make any correction to your Personal Data for the reasons permitted under law, such as where the expense of providing access to you is disproportionate to the risks to your privacy.